The Tom Bihn Pilot is one of the most Versatile bags in my lineup. I have never been a fan of Messenger bags or sling packs, however, the Pilot has changed my mind. I have come to notice that most of my backpacks are too big for my EDC gear. The Pilot forces me to only take the gear I need and nothing more. While I was using the Pilot if I was planning on going to the gym or CrossFit either before or after work I would pair it with one of my smaller duffles and it ended up working great. Tom Bihn is one of my favorite companies in the Bag world. I love the materials they use and they somehow continue to amaze me with every bag I purchase from them. Each bag has a great way of utilizing space and prompting you to follow. All of their bags come with a lifetime warranty and un-unrivaled customer service. Plus they are made in the US. The version of the Pilot I purchased is the 400D Halcyon with a Sky interior. TB also rotates color/material combos which can sometimes make each bag special. I opted for the Halcyon material after using my new Synapse 25 which is in the Blue Halcyon and I immediately fell in love with it. The Halcyon is much lighter than the Ballistic nylon TB also is using right now and I love how flexible the material is. The only do side to the Halcyon I have found, which is not that big of a deal to me, but the bag will not stand up when unpacked. I found the lightweight/flexibility/ and the way it just sheds off my dog's hair to be more beneficial. The Halcyon has also done a great job at standing up to everything I can throw at it. We will have to see how it ages compared to the Ballistic, although for EDC I feel this will be plenty to last a lifetime. The Pilot is comprised of 4 Main compartments. The main compartment has two sleeves inside and is surprisingly roomy. 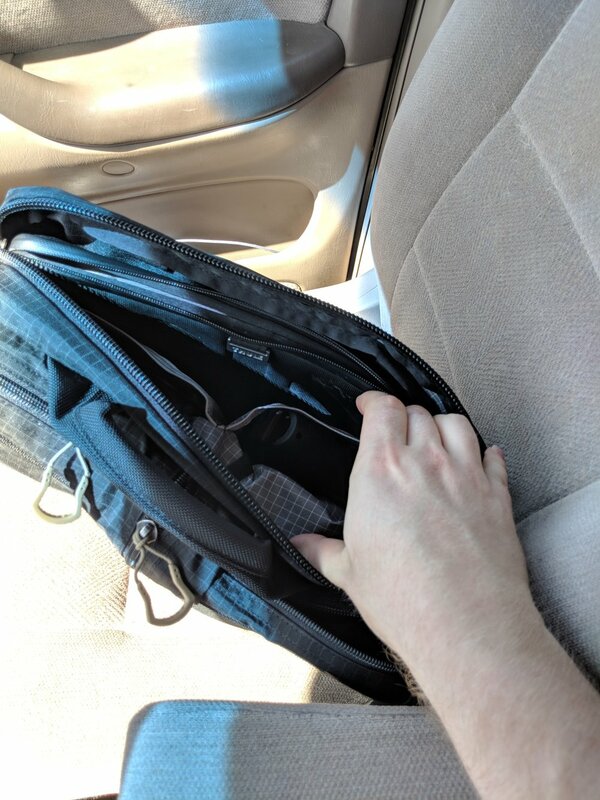 Using the PIlot day to day I would keep my 13 Inch Chromebook pro within a sleeve, my Glock 19 as my concealed carry choice, and a notebook and possibly some study material. 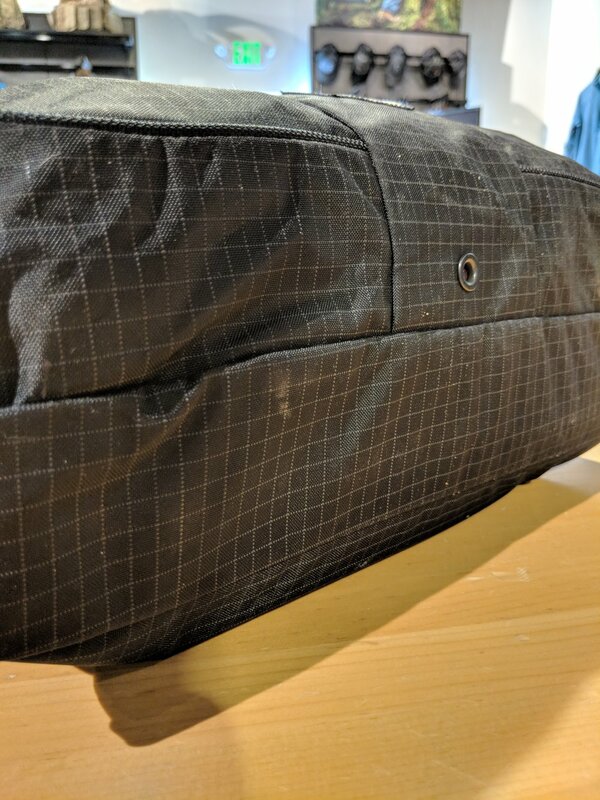 This compartment is still large enough to hold a light outer layer as well. The two front pockets were where most of my days gear would sit. 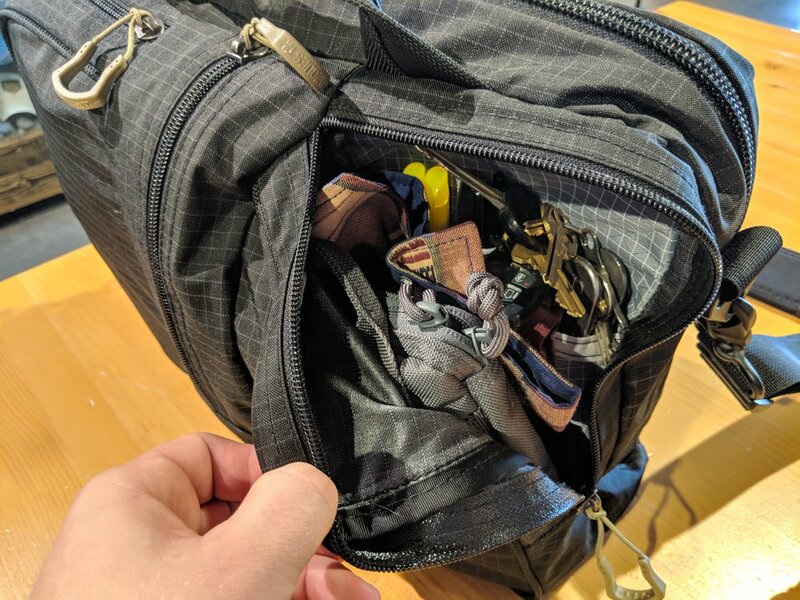 I used the right pocket to hold my smaller EDC items like multi-tool, knife, flashlights, pens, pencils ETC. 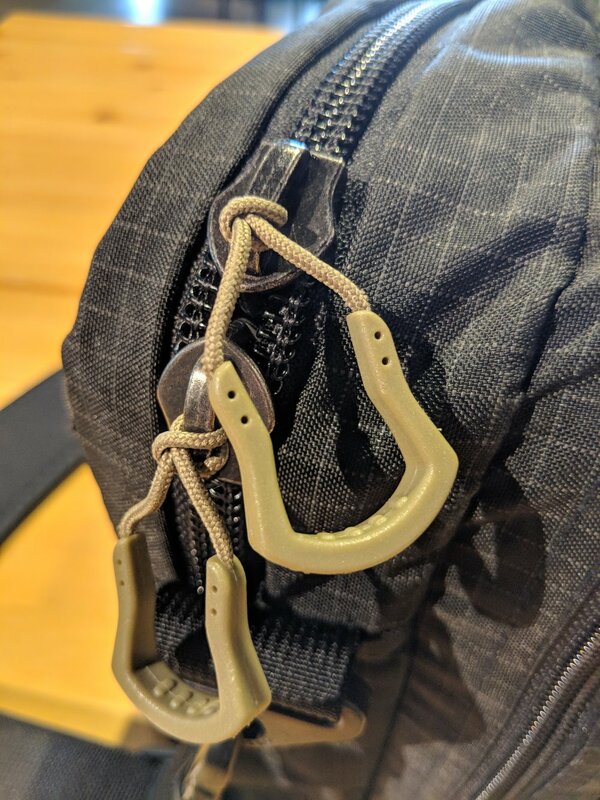 One feature on Tom Bihn bags are the small O-rings hidden throughout almost every pocket. These can be used to attach smaller pouches and pockets to the bags. A brilliant feature that I really utilized with the Pilot. I kept a small Halcyon pouch holding chapstick, eyedrops, lotion and all that stuff within this pocket as well. The left pocket is where I would keep my Med kit which was held by a Tom Bihn Side Kick. If I was not carrying this Med kit I would use this pocket to carry whatever else I needed instead. 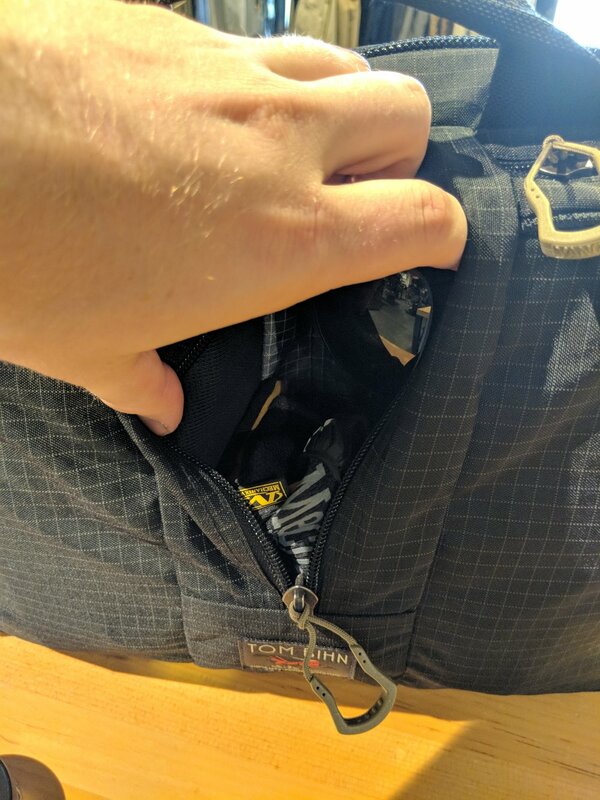 In the middle pocket you can store a normal sized water bottle, however, I carry a 40oz or 64oz Hydro flask day-to-day so I kept my gloves, rope, and a headlamp in this pocket. Right above this pocket there is a large padded grab handle. The zippers on the Pilot are one of it's strong points. A huge downfall of a lot of bags will be the zippers. Tom Bihn has some of the best around. Even though most bags I review have YKK zippers the Pilot and other TB bags use #8 and #10 Aquaguard zippers. They take a couple of days to break in and become smooth to open. I will admit after the purchase of my first TB bag I thought the zippers were much too difficult to open and were overkill. Since then I have fallen in love with the zips TB uses and truthfully, it is hard swapping between bags after using any of my TB bags. A huge + for the Pilot here. As I said earlier I normally carry backpacks for my EDC but the Pilot really changed my mind. 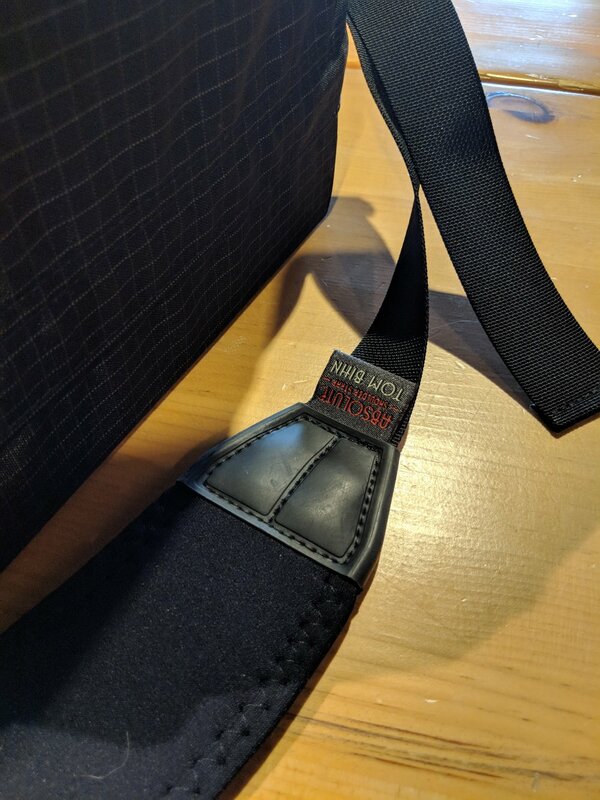 I used the Pilot with the Absolute strap from Tom Bihn which is one of the best straps for any bag. I have them on my duffles and on the Pilot. I carried the pilot as more of a cross-body bag and it handled very well. 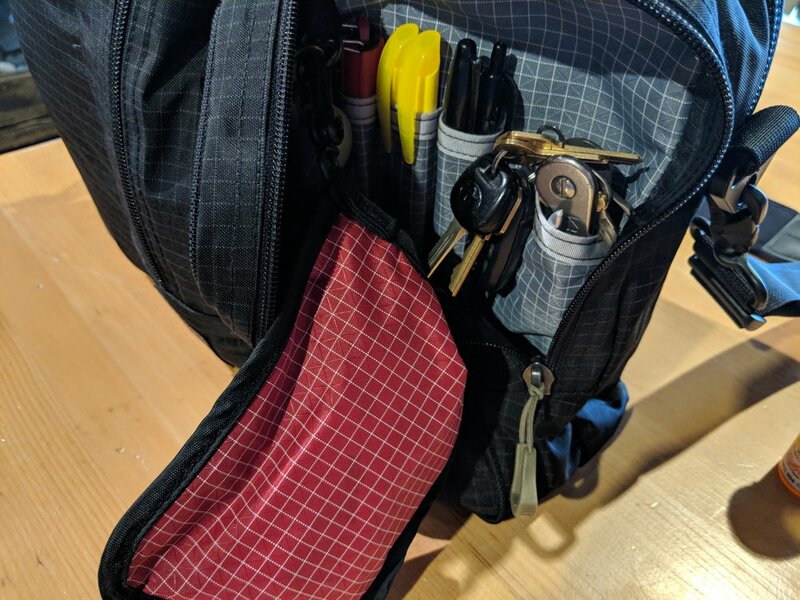 The Tom Bihn Pilot is a great EDC bag and has been with me for the past month without hesitation. When I need more gear for the day or the gym I can use a larger backpack or pair the Pilot with a small duffle. It has plenty of pockets and some really well thought-out organization. I will continue to use Tom Bihn products due to their excellent customer service, their US production, and lifetime warranty. If you are interested in the Pilot you can find them here.